PAINT THE TOWN GREEN Ken Loach’s gritty historical film recalls one leg of the long, strange trip toward Irish sovereignty. This Tuesday, Northern Ireland is set to inaugurate its first-ever power-sharing government, thanks to a historic accord between a former Irish Republican Army commander and his longtime Unionist arch enemy. Meanwhile, English director Ken Loach (Hidden Agenda, Land and Freedom) uses the time machine of cinema to remind us why it took years of careful negotiation to achieve that springtime détente. The movie's setting is rural Ireland, starting in 1920. In the wake of the 1916 Easter Rebellion, troops of British Black and Tans patrol the countryside, brutally suppressing stirrings of dissent. When a young local man is killed after he taunts the soldiers, refusing to state his name in English, his peers join up with the IRA. Low on guns, they wage war on the occupiers using the weapon of surprise. Bloody ambushes lead to arrests and torture sessions, which in turn lead to more bloody ambushes. Though the landscape is very green, there's no Irish charm or sentimentality in this movie - war is hell, even for a good cause, and Loach wants us to know it. He stages an IRA execution of traitors against a ferny hillside worthy of a postcard, and he shows us how that cold-blooded, politically necessary act affects both the relatives of the dead and the man who pulled the trigger. The film eschews standard war-movie embellishments such as a swelling score and montage sequences, leaving us with faux-documentary realism. We get the sense that for Loach, the movie's real hero isn't anyone in particular. It's the community pulling together against a common enemy, and then struggling with the new challenges of self-governance. In one scene that looks a little like a town meeting, the rebels - men and women alike - argue over whether to encourage the redistribution of the village's wealth. Loach, known for the pro-socialist slant in his movies, suggests that the IRA missed an opportunity here to become a truly radical liberation force. But since this is still a drama, it needs a protagonist. 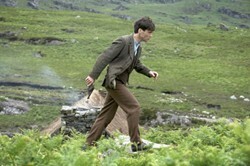 The action focuses on Damien (Cillian Murphy), who's about to leave for medical school in England when the conflict breaks out. His militant brother Teddy (Padraic Delaney) tries to recruit him, but the idealistic Damien is more swayed by the example of railway union members who refuse to transport the British. For a while, the brothers fight shoulder to shoulder. But after the Republicans accept a peace treaty, inaugurating the Irish Free State - and the partition of Northern Ireland - ideological differences drive them apart. Loach and screenwriter Paul Laverty are on familiar ground when they dramatize the 1922 Irish Civil War as a conflict in a family, a literal house divided. But the characters remain on the drawing board, more ideas than individuals. Murphy, who starred in 28 Days Later and then did juicy turns as Hollywood villains in Red Eye and Batman Begins, is plausible as an extremist with a conscience. (And his brogue is so thick, it's easy to forget him in those other roles.) But the devices the script invents to motivate Damien aren't always adequate to the task. A romantic subplot feels perfunctory. One element that's sorely missing from the film is a glimpse of life in this town before the Black and Tans martyred a local lad. Some glasses raised in the pub and feeble flickers of humor are the only hints we get of normalcy. Loach's focus on the conflict is relentless, and scenes involving torture and murder are excruciating to watch. But then, that's the point. By removing all the gimmickry and fun we associate with action movies, The Wind That Shakes the Barley forces us to contemplate the costs of violence - and to value the impulse that made two old diehards shake hands in Belfast this month.